So, you want to be a farmer??? If you are serious about wanting to operate your own farm one day then this is the internship for you! This is not an opportunity for people interested in “trying their hand at gardening”. 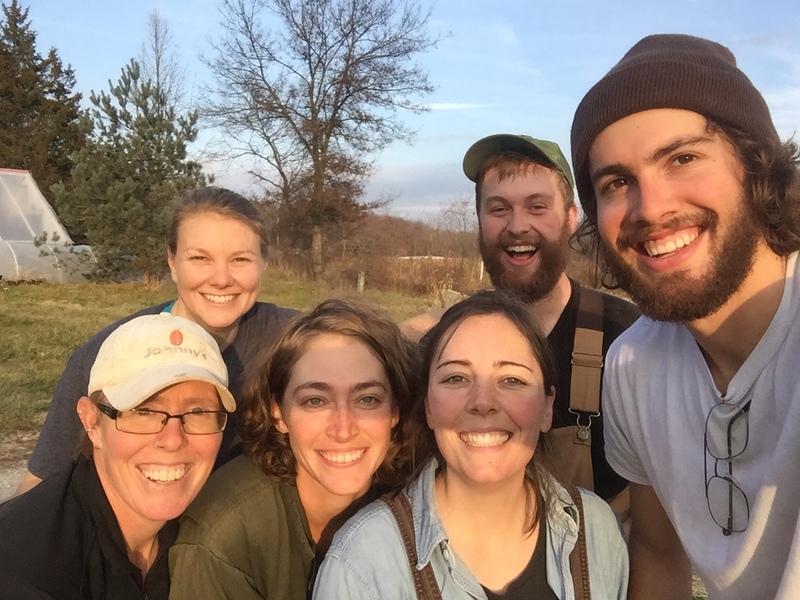 An internship at Happy Hollow Farm will provide you with the opportunity to learn many of the skills you will need to be a successful small scale certified organic vegetable farmer. My first experience with Community Supported Agriculture was as a member of a CSA farm while in graduate school. I was hooked; you could say I had found my calling. But I didn’t know the first thing about farming! So, I attended a few organic farming conferences in upstate New York and everyone I talked to said I should intern on a few farms before venturing out on my own. I’m VERY thankful that I listened to their suggestions! I learned an enormous amount and am certain saved myself countless mistakes, time & money by working with other farmers. When hiring interns/apprentices farming experience is definitely not the first thing I look for; what I do require are a willingness to work hard, learn what I have to teach and all the while enjoy what you are doing! If farming for a living is not truly your long term goal then you will find out very quickly that you will not be happy doing the extremely physical work day in and day out that farming requires. 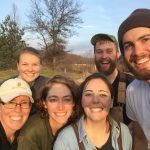 My goal with providing an internship opportunity is to teach as much as I know about all aspects of farming from greenhouse work, in the field planting & weeding, planning/scheduling/organizing, bugs & diseases, equipment repair & maintenance, construction skills (when applicable), and everything else in between. While simultaneously working, working, working (in all weather) and having fun and enjoying the work while we do it. 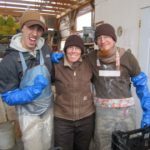 An internship with Happy Hollow Farm will provide you with one of the fullest most in depth experiences you could hope for on a certified organic vegetable farm as well as an extensive learning opportunity for new farmers wanting to get their hands dirty and experience the good, the bad, the ugly & the immense rewards of organic farming. Spring/Summer/Fall Season: April 1st thru October 31st. Planning and preparation for the 24 week long summer & 8 week long winter CSA seasons begins long before share distributions actually start. Arriving in the spring will allow you to experience much of the behind the scenes work that it takes to provide 38 consecutive weeks of veggies to a CSA and farmers market. 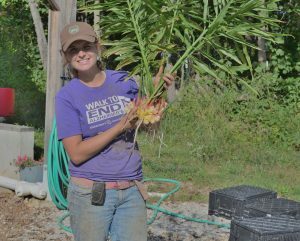 Working throughout the majority of the season will provide you with real insight into all that is involved in running a nearly year round vegetable farm. Work Hours: 8:00-5:00 Monday thru Saturday (with a 1 hour lunch each day). These hours are a rough estimate as there are always days when we work longer or cut off early. This is NOT like any other job you’ve had. It is very weather dependent and if we have another year like 2010 I have to take advantage of every dry moment there is. One lunch each week (Thursday) will be potluck style and shared with all people on the farm that day. Stipend & Housing & Food: $400/month, housing provided on the farm, an Egg Share & a Single Share membership in the CSA for the 24 week season. Scheduled class time: As this is an internship position there will be a one hour scheduled class time every other week and a book about farming that will be used as a semi-texbook (the farm will provide the book). In 2019 we will raise just over 7 acres of vegetables (including 4 high tunnels and multiple low tunnels). I will also be adding some fall bearing raspberries. The farm is moderately mechanized: I use a tractor for tilling the soil, mowing, transplanting and hauling heavy stuff, but the weeding, harvesting and some planting is done by hand. I’m expecting to hire 3 full-time seasonal employees, 5 part-time summer season employees and 2 full-time (7 month long) internship positions. This is a small farm and I work side by side with my workers. Everyone shares in the big jobs of weeding, planting, harvesting, washing and packing produce. 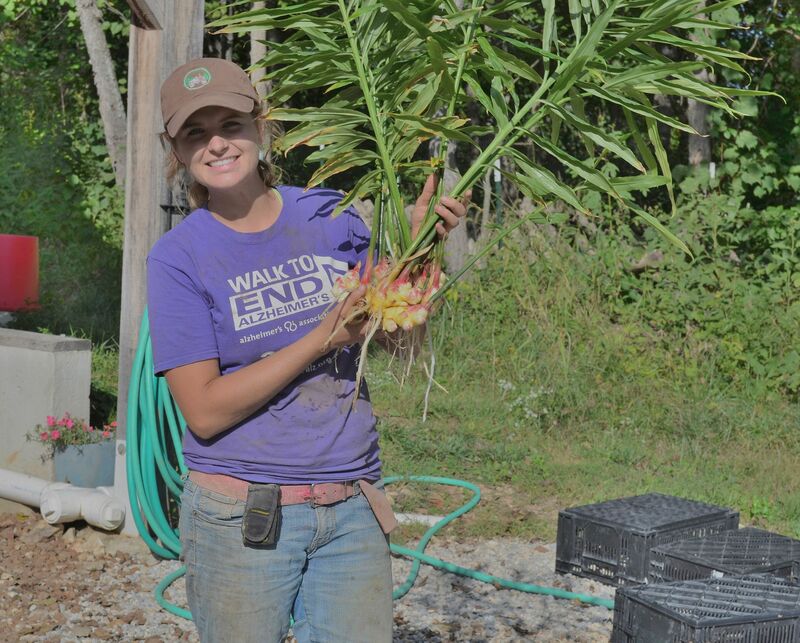 Some employees & interns specialize in particular areas of the farm, such as tractor operation or caring for seedlings in the greenhouse. I typically work 9-10 hours per day, Monday thru Saturday. During the peak summer months it is not unusual to work 10 hours a day. 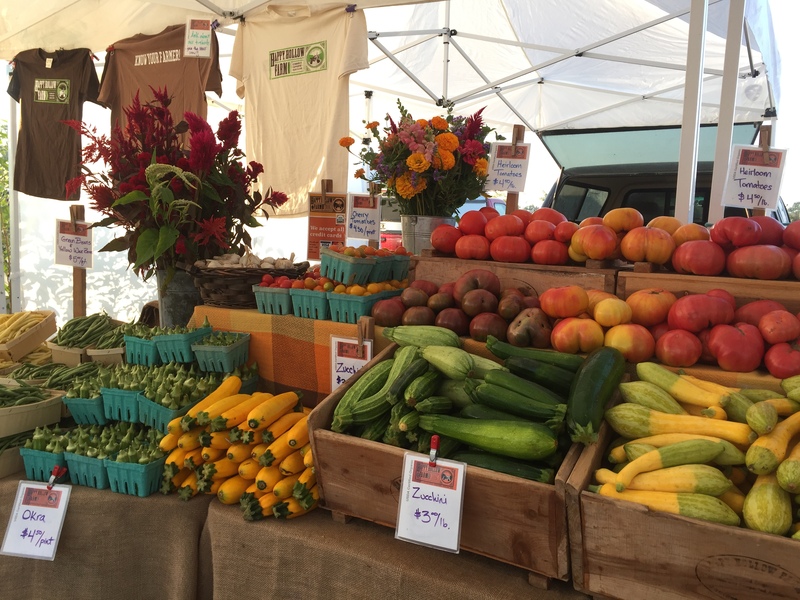 Depending on skill level and interest, employees and interns will share the responsibilities of farmers market days (Saturdays) and/or lead a crew on Saturday mornings when CSA members come to the farm to fulfill their Farm Work Shifts. For 35 weeks of the year (April thru December), I follow a weekly harvest & delivery schedule for the CSA & farmers market. On Tuesdays and Fridays the entire crew typically works all day harvesting and washing produce. That produce is stored overnight in our coolers, and on Wednesday afternoons CSA shares are delivered to Columbia where they are distributed to members. 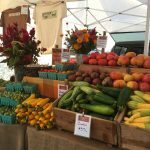 On Saturdays I sell at a large farmers market in Columbia, MO as well as distribute CSA shares at the market. 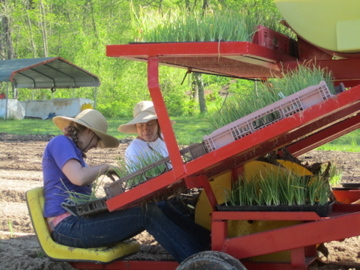 On Wednesday afternoons and Thursdays the crew focuses on sowing seeds, weeding, transplanting, trellising and other various farm tasks. I am serious about what I do and the quality and reputation of the farm. I enjoy talking, learning, laughing and enjoying each others company while working. But we will be working hard all the while. I take great pride in my work: the work that feeds people, the work done by the hands we know, the work that keeps the land healthy, productive & beautiful. I love the sight of a well-weeded row, a neatly trellised tomato plant, and a crate of newly harvested head lettuce. If you appreciate & value the results of a hard days work then you’ll be happy and valued here. I deeply appreciate the contributions everyone makes to the daily operation of this farm. Many of my most joyful and vivid memories are of the work I’ve done alongside employees, apprentices & friends. I am considerate and respectful of everyone on the farm and I expect the same from those I work with. I devote much of my time and thought to training & educating workers, answering their questions, and making sure they understand their work. This is a production farm. While all farms are subject to the vagaries of unpredictable weather and mechanical breakdowns, I have put years of experience, thought, and planning into shaping methods that work. I am organized with my time, my tools and the daily operations of the farm. You’ll work hard here, but your work won’t be wasted. If you want to learn how to raise vegetables on a small organic vegetable CSA farm, you’ll see an example of a system that works. I’ve worked with many employees both here and off the farm. Most have been productive, satisfied workers who raised fantastic food for people in our community. I’ve listed here the qualities which distinguish successful from unsuccessful workers. These are the standards by which I judge applicants. I am laying these out not to be harsh, but to be clear. You should read and understand these standards before you apply or interview here. You must be able to do repetitive physical work outdoors in hot, cold, and rainy weather. Your knees and back must withstand bending, kneeling, stooping, and sitting on the ground for hours at a time. You must work carefully and be detail-oriented. I am picky and fastidious. My quality standards are exacting. At the same time, you must be fast. Not sloppy, rushed, or careless, but quick and efficient. Time is money; and money pays you, pays us, and keeps the farm afloat. You must communicate and cooperate with your co-workers. There are few things more frustrating than work which was left undone, was done poorly, or took too long because workers did not talk to each other or work together. In the end, I am flexible and understanding. I recognize and appreciate human differences, and I’ve worked happily and long beside employees who’ve had some shortcomings in the areas above but who were trying their honest best. But without exceptions, you must have a good attitude. I have no tolerance for people who don’t respect their work and their co-workers. If you’re lazy or rude, then you won’t work here. You do not need experience. Many great workers have come here with no experience growing vegetables. However, workers with experience are likely to start with higher pay and more responsibilities. I offer housing to interns and potentially to a full-time worker in the comfortable finished out loft space in our barn. The house can accommodate 3-5 people (2 spaces are specifically allotted to apprentices). There is WiFi service in the barn. The farm is located in a valley and cell phone service is quite spotty. The nearest city is Columbia, MO (45 minutes) and Jamestown, MO (12 minutes) from the farm. Jamestown is close but other than a hardware store, post office, gas pumps & bank there aren’t many other businesses. If you would like or need to find rental housing near the farm please let me know in advance so that we can discuss various options. I will consider part time and full time applicants for both employment positions. Click on one of the links below to read a job description and instructions for applying. Application deadline: Applications will be accepted until positions have been filled. 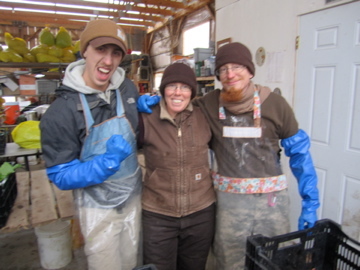 If you are interested in a WWOOFing position on the farm please visit the WWOOF USA website. You must be a member of WWOOF in order to access details about the various farms and positions available. Numerous options are available for potential WWOOFers.